With a tagline to “Indulge Your Senses,” the high energy eatery is known for its quality food and a huge variety of craft beers. Turn into Cosmo’s Courtyard at the big sign on Canal Street, then drive all the way to the back to discover a Southern gastropub offering small plates and shareables. Locals love Luna’s. There’s lots of repeat business. They don’t want to be considered a sports bar, but to be fair – there are a lot of TVs, so it’s a great spot to catch a big game. Ladies will love sitting at the bar for two words – PURSE HOOKS – at every seat. Proud to be in Alabama, from the art on the walls to the drink in your glass, Luna’s keeps it local. There are 32 beers on tap, for the best beer selection in town. You’ll even find several in-state brews, at least 7 or 10 on any given day. Local Alabama liquors are also available to pour. When it comes to the food, if you like mac and cheese, you’ll love Luna’s version. Cavatappi pasta is oven-baked in a rich cheese sauce and topped with seasoned breadcrumbs. You can even add in Conecuh sausage, pork belly, shrimp or chicken. The menu runs the gamut from Southern dishes to seafood, to burgers and dogs. There’s even a little Vietnamese thrown in the mix. 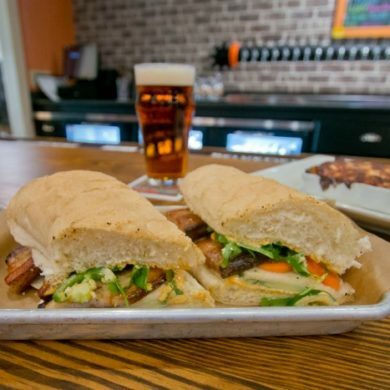 The Bahn Mi features roasted and sliced pork belly, pickled veggies, jalapeños and cilantro serves with sesame-sriracha mayo on a toasted french baguette. Owners Brian and Jody Harsany of Cosmo’s and Cobalt opened the new restaurant and a 200-person event center, perfect for weddings and other celebrations. The Harsanys have a lot in store for restaurant goers. At Luna’s, they’ll be hosting wine and beer dinners once a month with five-course meals, held the second Thursday of the month. There’s also a popular brunch both Saturday and Sunday from 10 a.m. to 2 p.m.
Luna’s Eat and Drink is located at 25689 Canal Road in Cosmo’s Courtyard of Orange Beach AL. For more information, please call (251) 980-5862 or visit the restaurant website.